The Tiger had an air filter system, named "Feifel", on its rear decking. This kit provides a version of the Feifel and tells you to install it, in steps 71 through 73. The kit's instructions are correct with regards to Tiger "231", one of the decal options. But the other decals, for "Tiki", don't match the parts in the kit. The Tiger called "Tiki" carried an earlier version of the Feifel system that's not provided in Revell's kit. Fortunately, "Tiki" did not carry its air filter system in April 1943, when its markings matched the kit decals. Air conditions were not bad enough to require the filters. There are many photos of "Tiki" from this time and none of them show the filters installed. But the tank did carry one part of the system; the V-duct on the engine hatch. 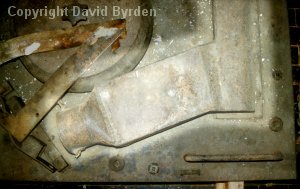 This photo of a Tiger engine hatch shows part of the duct (highlit). You can obtain this V-duct in the Revell kit by cutting the connector pipes off Part C51.